And because North Texans demanded it, DFW NORML has chartered a bus to drive us from DFW to Austin and back and we’re making tickets to board that bus available for a donation of $25 per ticket here, though we do have a **limited** number of seats we can make available for people interested in attending but without the money to purchase a ticket. Please email questions@dfwnorml.org with the subject “FEB 18 BUS TICKET” if you would like to take advantage of one of these seats. SERIOUS INQUIRIES ONLY PLEASE. The DFW NORML bus will depart from Walmart Supercenter (4801 South Cooper St, Arlington TX 76017) at 6am sharp so please plan to arrive by 5:30am. We must leave on time to stay on schedule. 5:30am – Meet at Walmart Supercenter. Since Walmart is open 24 hours, you will be able to run into the store to purchase any last minute items before boarding the bus. We’d suggest having someone drop you off here, though leaving your car parked in the parking lot is an option since we won’t be gone overnight. 6:00am – The DFW NORML bus departs from Walmart in Arlington. 7:30am – Restroom break at Czech Stop (Czech Stop, 104 South George Kacir Drive, West, TX 76691) for 15 minutes. 7:45am – The DFW NORML bus departs from Czech Stop in West. 9:30am – Arrive in Austin and park bus at Mexita’s Mexican Restaurant (1107 North Interstate 35 Frontage Road, Austin, TX 78702) where we will have an optional buffet available to our group for $10 per person. 10:00am – Begin walking from Mexita’s down 12th Street to the Texas Capitol. This is approximately a 15 minute walk. Once there, we will each be required to pass through security which includes a metal detector. From there we will head to the Robert E Johnson Conference Center for checkin. 11:00am – Lobbyist training begins. 12:00pm – Break for lunch. 1:00pm – Split up into teams to begin lobbying. 5:00pm – Finish lobbying and meet back at Mexita’s. 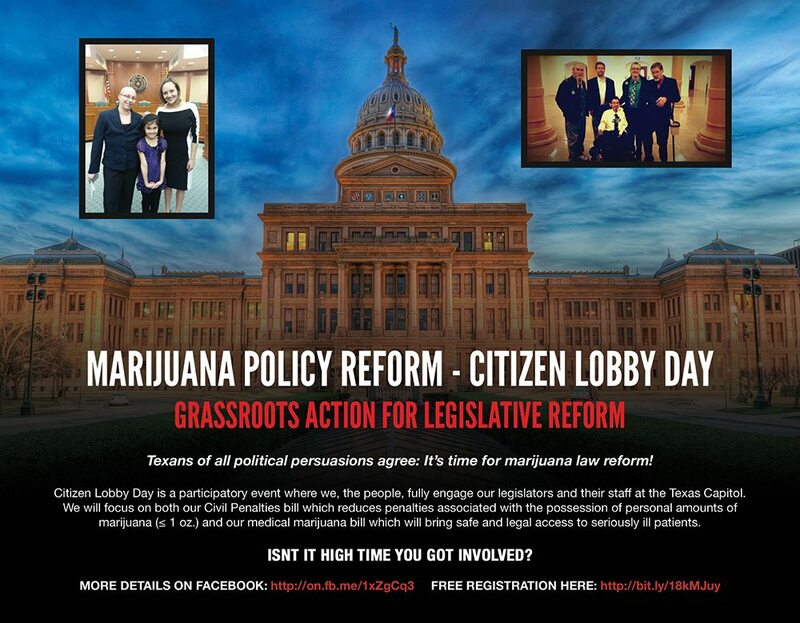 6:00pm – The DFW NORML bus departs from Mexita’s in Austin. 7:30pm – Stop for another 15 minute restroom break at Czech Stop in West. 7:45pm – The DFW NORML bus departs from Czech Stop. 9:30pm – Arrive at Walmart Supercenter in Arlington.